1. Stylus – his sister has one. Her school gave out iPads in seventh grade, so she spends every evening doing math, English, and science on the iPad. I don’t know if my son really needs a stylus for his Minecraft obsession, but he does want to at least appear as pro as his sister. 2. Skylanders Giants – this is the big Wii and xBox game of the season. It feeds the pre-tween desire to collect figurines with a game that requires a special add-on attachment. $75 though. 3. Calvin and Hobbes Science Progress Goes Boink – All I care is that he’s reading, and if Calvin & Hobbes is the heights of his literary taste right now, so be it. It could be worse. 4. 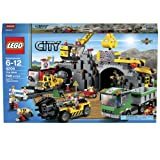 Any LEGO City collection. Yes, the maw of the LEGO god must be filled and my son’s latest obsession is with the worldly objects of the City collection, as opposed to his dalliances with Ninjago and LEGO Star Wars. 1. Nerf Nightvision Camcorder – I would have died for something like this at 8 years old. This infrared camera functions as a night binoculars, but also records video to an SD card. You can actually see up to 50 feet at 4X magnification in the dark, which is perfect for spying on the raccoon who has been vandalizing our backyard, though I don’t know what we’ll do if we get the goods on him. This is the perfect age to get this. It is not the toy to put in the hands of a 12 or 13 year old however. 5 (?) and up. $90 on Amazon.Of course, he keeps asking for an iPad, but that’s not going to happen. Here are a few things though that I am eyeing because they look like I’d have fun playing with them too (unlike Skylanders). Anything I can get for him that gets us to spend more time playing together is a good thing. 2. 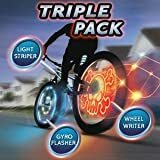 Fuze Wheel Writer– I love this modern variation on the card-in-the-bicycle-wheel. This small device easily mounts directly not the spokes and shows 12 animated designs as you bike. It even includes a speedometer mode, though that is more for showing off how fast you’re going since it’s kind of hard to read from where the biker is sitting. Works on most bikes wheels 20″ and above. $20 on Amazon. 3. New Perplexus Twist – The family has spent hours on the Original and the Epic trying to get the little ball from Number 1 to Number 80. Now Perplexus as a new twist on the game: you literally have to twist the two halves of the globe at certain points to make the paths line up. I love this game, not only because it reminds of hours spent with my Brio Labyrinth as a child (admittedly pre-video games) but also because it’s a challenging game that doesn’t involve electronics. There’s nothing wrong with video games per se, but it’s fun to see a child again immersed in a problem without attendant beeps of synthesized sounds. The Perplexus Twist is on my wish list. Maybe my son will give it to me and then I won’t have to pass it to him when I lose. $25 on Amazon. 4. Nerf Lazertag System – I’ve wanted this ever since I saw it at Toy Fair a year ago. These guns can be played with as a pretty decent laser tag game, but are best when you add in augmented reality, the future of electronic gaming. To take advantage of this feature, players must insert a WIFI enabled iPhone or iPod Touch into the special cradle in the gun. Then players see reality around them and enhanced reality through the iPhone’s camera. “Enhanced” because the iPhone screen shows real live video combined with animations of aliens or explosions around friends. I can only imagine since I do not have one… $55 on Amazon for a 2 Player Pack. 5. 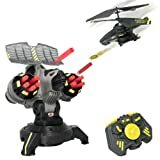 Air Hogs Battle Tracker Helicopter – Could we even have Christmas gift lists without an AIr Hogs helicopter on the list? After the fun we had with Heli Replay earlier in the year, I want to graduate to this helicopter/target setup. The Missile station tries to shoot you down while your helicopter tries to hit it with missiles. Now that these helicopters can do more than just go up and down, this is the next generation. $100 on Amazon. With even a few of these under the tree for my son, and I’ll be as excited as he is on Christmas morning. What do you think odds are my wife will get any of them for me if I put them on my list?